Materials technologies are involved at every step of the manufacturing process from novel feedstocks to shaping technologies, to advanced sensors, and ultimately, to high performing products. Innovations in materials science and engineering offer enormous potential to boost next-generation manufacturing in the United States. This can mean new job-creation, new solutions to technical challenges, and even the birth of new industries. 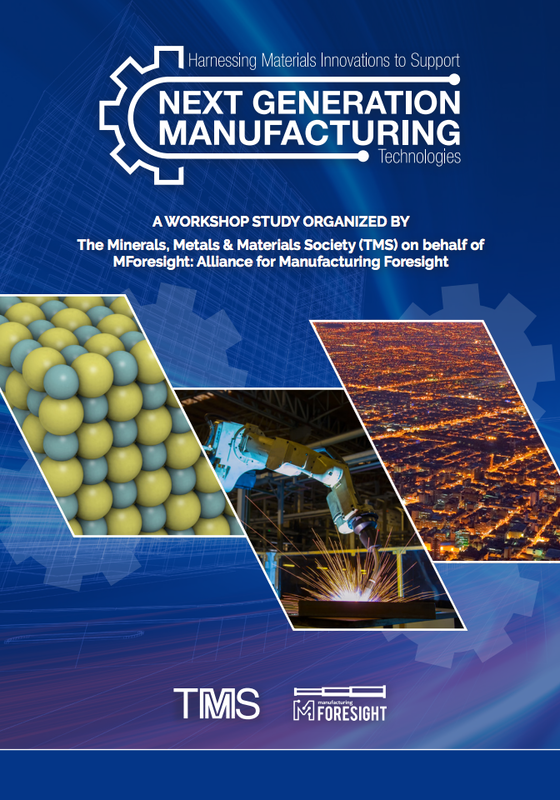 In partnership with MForesight, The Minerals, Metals and Materials Society (TMS) recently convened leading experts in the materials and manufacturing community to identify areas of innovation that are likely to have significant impacts on the next wave of U.S. manufacturing. America has an unmatched history of manufacturing innovation. For more than a century, this has been the foundation of the country’s competitive advantage in the manufacturing sector. Today, there is great potential for materials innovations to help usher in the next generation of manufacturing technologies. Given the extraordinary range of opportunities, however, it’s important to prioritize. We hope that this new report will advance the conversation as the materials and manufacturing communities come together to identify the specific areas of innovation that offer the greatest potential. MForesight: Alliance for Manufacturing Foresight is America’s “think and do” tank. We focus on accelerating technological innovation and aligning research and development opportunities with national priorities to enhance U.S. manufacturing competitiveness.